Sitting along the famed Blue Ridge Parkway and surrounded by one million acres of protected wilderness, Asheville’s backyard features the highest mountain peaks east of the Mississippi. You&apos;ll find thousands of miles of hiking and biking trails and unmatched biodiversity that brings a parade of mountain color from summer rhododendron blooms to fall foliage displays. Not to mention, George Vanderbilt’s 8,000-acre playground at Biltmore Estate is just waiting to be explored. In 2018, you can experience new off-road adventures at Biltmore, mountain trails, outdoor yoga classes and riverside hangouts. 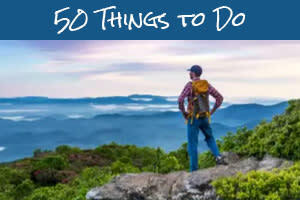 Here&apos;s a look at the many new ways to explore the great outdoors this year in Asheville! Take a new trail, hop on a tour to spot elk and experience a family-friendly hotel hike. Perfect Picnic Trail Expands: Bearwallow Mountain Trail, a Hickory Nut Gorge-area trail known for its Instagram-worthy views, grazing cows and spring wildflowers, now has a new neighbor trail. 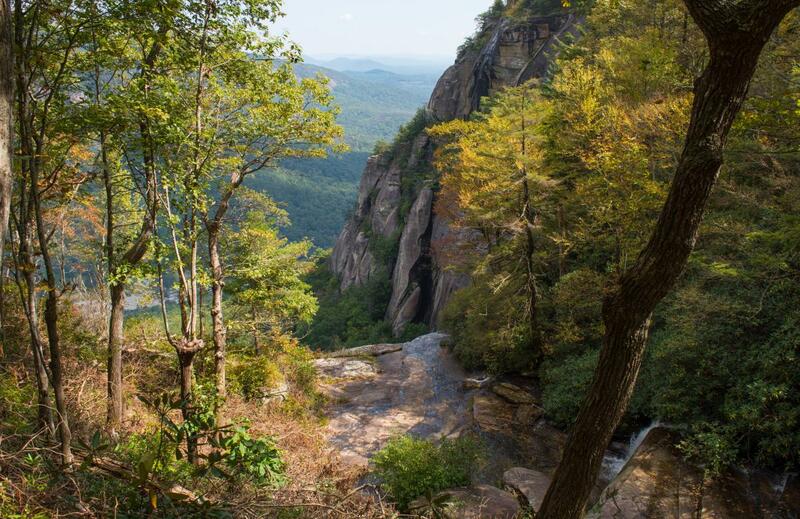 The 3-mile Wildcat Rock Trail goes to a 100-foot waterfall, towering cliffs and panoramic views. The trail is a national award winner, receiving recognition for trail design and construction from the Coalition of Recreational Trails. 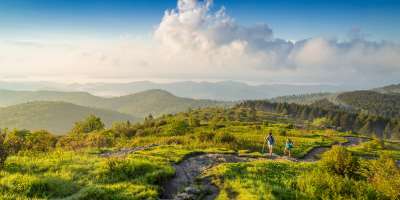 Recently announced: Thanks to new Conserving Carolina conservation easements, this trail will extend across the mountain to connect to Bearwallow Mountain in the next few years. More info on the Bearwallow Mountain Trail. Elk-Watching in the Smokies: NEW for 2018, Asheville Hiking Tours is rolling out a biologist-designed, guided “safari-like” Smoky Mountain Elk Tour, with guaranteed viewings, the story behind the reintroduction of the creatures to North Carolina and the history and ecology of the Appalachian Mountains. 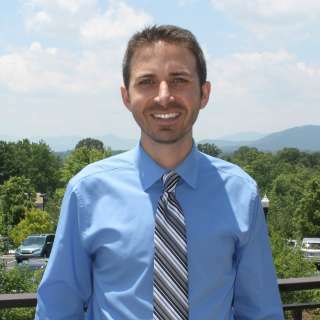 A Family Hike: Holiday Inn Asheville - Biltmore East constructed a beautifully landscaped 2-acre wooded walking trail, conveniently located just off the parking lot and providing an easy escape. The hotel is pet- and kid-friendly and also features an outdoor pool with serene mountain views. Tour Biltmore via electric adventure vehicle, try an Asheville-invented watercraft and climb the treetops at night. Go Off-Road Through Biltmore’s Backyard: NEW this summer, a two-hour-long Outrider Tour takes guests on remote off-road trails and roads on the grounds of America’s Largest Home via electric recumbent tricycle. More adventures are coming soon to Biltmore including falconry and fly fishing from a kayak! 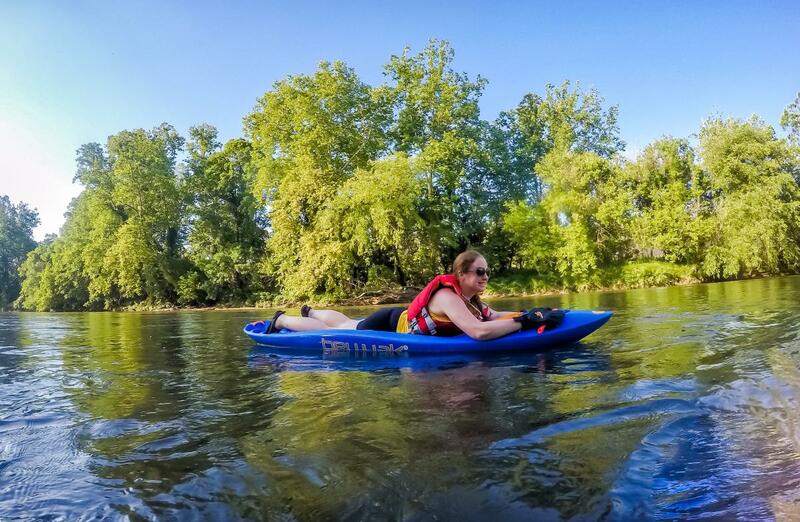 Belly Up to the River: Now available for rent at French Broad Outfitters’ Hominy Creek location, Bellyaks were invented in Asheville and allow you to ride the river on your belly with a face-first kayak and webbed gloves for paddles. This kayaking alternative provides a unique vantage point while floating downstream, or for more extreme whitewater adventures. See the Sights at Night (NEW! ): The Adventure Center of Asheville is hosting night climbs, Twilight in the Treetops, at their Treetops Adventure Park, Saturdays (June 2 – Aug. 25). Catch the sky transforming from dusk to night while the trails and obstacles are illuminated (ages 4 and over). International Horse Sporting Event in Western N.C.: The FEI World Equestrian Games, the largest sporting event in the United States in 2018, takes place in nearby Tryon (45 minutes southeast of Asheville) Sept. 11-23. The games, expected to attract nearly 500,000 people from more than 70 countries, include competitions such as jumping, dressage, endurance, vaulting and reining. More info. Pop-Up Gear Manufacturing: Diamond Brand Gear – whose storied 136-year history includes manufacturing the very first backpack for the Boy Scouts, as well as supplying the U.S. military in both WWI and WWII – has just opened a temporary “micro” factory in downtown Asheville (through January 2019), offering a behind-the-scenes look at their production, as well as exclusive products available for purchase only at that location. Visitors can also get a hands-on experience sewing on their machines. 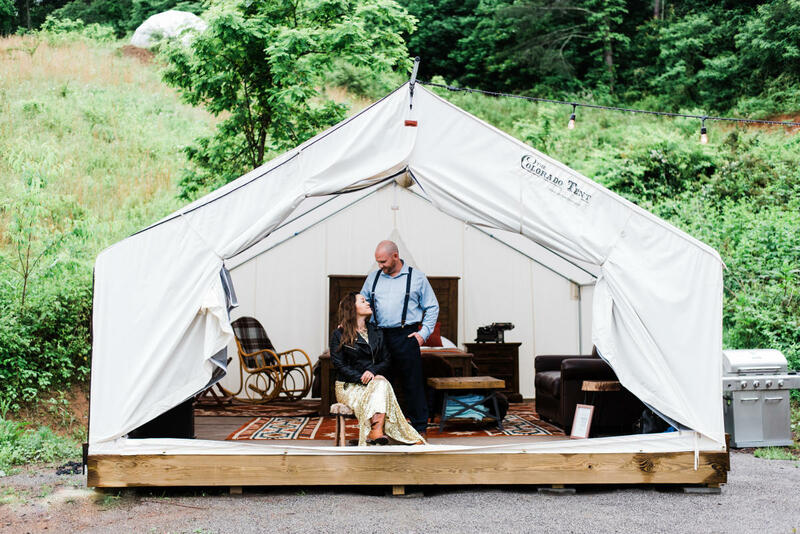 Glamp It Up: Choose from vintage trailers, Instagram-worthy airstreams, yurts and tent cabins with Asheville Glamping. A great getaway for couples, you can also upgrade your stay with a massage – and make it an outdoor one (with a shade tent available). On weekend mornings, guests can enjoy onsite outdoor yoga (until October). Added Value: Add some outdoor adventure to a trip through some of the area’s top vacation-rental companies. Yonder Luxury Vacation Rentals, Carolina Mornings and Greybeard Rentals offer outdoor-adventure deals and add-ons to customize your stay. 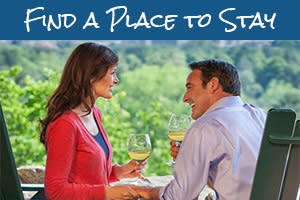 Check out their travel packages and more. TIP: See what life on the road is all about at the Asheville Van Life Rally (with general admission on Saturday, Sept. 22) at JuneBug Retro Resort (a new 50-acre property of colorfully restored 1950s campers just 12 minutes from downtown Asheville). This celebration of the “van life” community and culture, in its fourth year, will have a full lineup of music, food trucks, beer, a vendor village, swag and a children’s area. Discover a new outdoor restaurant and music and bar spaces that are making waves. White Duck Taco Shop River Relocation (NEW! ): Set to move its flagship location in early summer to 3 acres of riverfront property, this growing taco empire will now welcome tubers right off the river, taking over a refashioned military Quonset hut with a refurbished bus for an outdoor bar, a box truck for outdoor movie nights and picnic tables aplenty. COMING SOON: Burial Beer Co.&apos;s Forestry Camp, set on a historic property near Biltmore Village, will give new life to buildings that once housed young forestry workers of the Civilian Conservation Corps. Burial’s second location, it will also include a production brewery, taproom and restaurant. 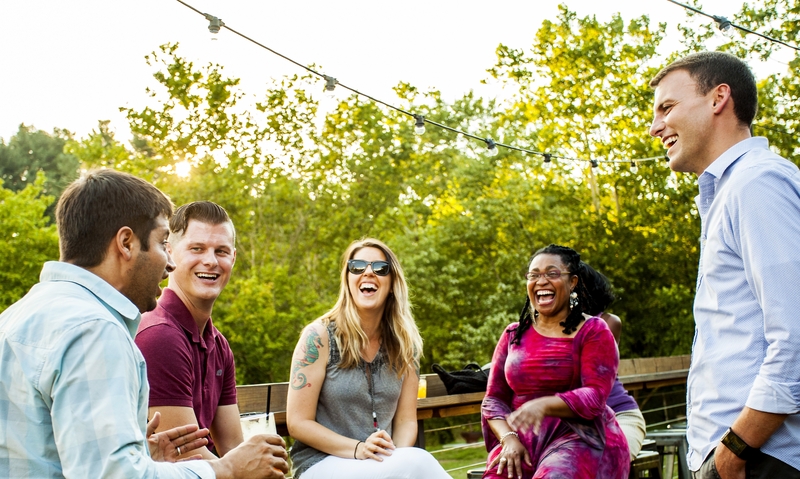 TIP: For more riverside fun, catch some live music at the junkyard-turned-shipping-container-themed Salvage Station or dine on the back deck of the largest container-constructed restaurant in the U.S., Smoky Park Supper Club. Try yoga on the water or with a beer or goat and feel the zen at a dedicated festival. SUP Yoga on the World&apos;s Third Oldest River: Wai Mauna, known for its sunrise Dawn Patrol stand-up paddleboard tours and six-person Party Barge, is offering SUP Yoga classes (NEW!) this season. The two-hour morning lessons include paddling instruction and a yoga session on top of anchored paddleboards along a calm stretch of water, led by professional instructors. Cheers to Buddhi Yoga: Hip-hop-inspired Buddhi Yoga, a local favorite, has moved to Archetype Brewing in the hot Beacham&apos;s Curve area of West Asheville, Sundays at noon. Zen out, get some exercise and wash it all down with a craft beer! A Winning Combo: Franny’s Farm hosts monthly sessions of Goat Yoga, great for beginners or those who simply want some cuddle time with cute baby goats! Asheville Yoga Festival: Taking place July 26-29, this event will feature more than 30 presenters and everything from yoga to meditation to music and outdoor recreation at various venues downtown (including Pack Square Park). Head outdoors for new experiences from picnics to farm tours to foraging. 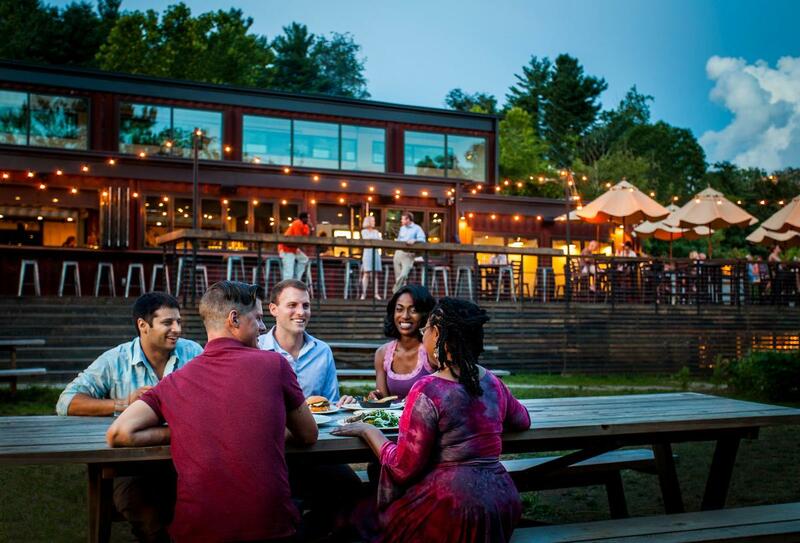 Asheville’s Top Restaurants Let You Take Your Meal Outside: Choose from a selection or build your own packed picnic lunch from James Beard-nominated chef John Fleer’s The Rhu and take it to your favorite scenic locale. Set to open later this summer, RendezVous – from the team behind French-comfort-food staple Bouchon – will offer picnic baskets to go or to enjoy on their lawn, a specialty garden and pétanque courts. Explore the Grounds of Biltmore Like a Vanderbilt: Do a private three-hour horseback trail ride – with a picnic lunch included – in picturesque spots of the 8,000-acre estate. Sample Your Way Through Asheville’s Surrounding Farmland: Taste local cheeses, gather fresh eggs, feed farm animals and find out more behind Asheville’s culinary scene with Asheville Farm to Table Tours, offering full- and half-day options incorporating creameries, Appalachian produce, craft beer and more. Must-Do Mushroom Hunting: NEW this season, No Taste Like Home is offering a monthly immersion series focused on specific wildcrafting and foraging skills. The longtime Asheville company is also adding even more tours to the schedule and new partner restaurants to prepare foraged finds from Blue Ridge Mountain terrain around Asheville (the second-richest temperate ecosystem on the planet). TIP: Enjoy Outdoor Late-Night Cinema at AUX Bar, a NEW downtown restaurant from the creators of Asheville’s popular Blind Pig Supper Club, featuring a special late-night menu and plans to install wood-fired grills and a bar on the patio this summer. Or, catch Isis Restaurant and Music Hall’s free outdoor concert series on their lawn while grabbing dinner (Wednesday-Friday evenings). Photo credits: Top photo by Jared Kay. Chimney Rock Trail photo by Jason Tarr. Asheville Glamping photo by Amber Robinson. Smoky Park Supper Club and outdoor dining photo by Erin Adams. Yoga photo by Emily Chaplin. Bellyak photo by Divergent Travelers (Lina and David Stock).